This exciting confirmation about Black Manta’s blockbuster future was revealed on the set of Aquaman, as I had the chance to visit the production in Melbourne, Australia with a small group of other journalists while cameras were still rolling. A part of our sit down with Peter Safran was dedicated to discussing one of DC Comics’ fan-favorite antagonists, and while talking about the character’s role in the movie he also revealed that this is only the start. Real name David Hyde, Black Manta was created by Bob Haney and Nick Cardy and introduced in September 1967’s Aquaman #35. He was initially portrayed as mysterious, powerful villain, notably outfitted with a large oval helmet with red glowing eyes, and it wasn’t until the early 1990s that his origin story was explained. As far as his future in the DC Extended Universe goes, there will surely be opportunities for him to return in specific Aquaman sequels, but it’s noteworthy that he’s been a part of some very important supervillain teams, including the Legion of Doom and the Injustice League (which is hinted at in the post-credits of Zack Snyder’s Justice League). 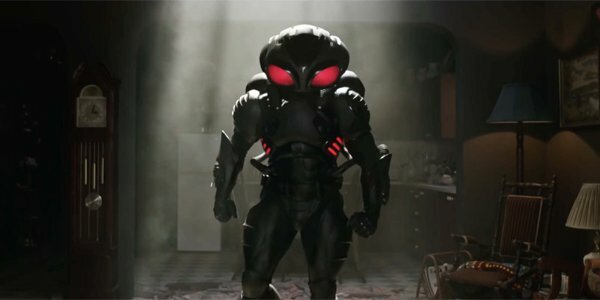 With the exception of Shazam and Wonder Woman 1984, Warner Bros. and DC have not made any major, firm announcements about the future of the DC Extended Universe, so we’re not entirely sure exactly when we will get to see Black Manta after Aquaman. That being said, if he’s as awesome as he was described on set, and looks as great as he did in the photos we were shown, then there’s a good chance audiences will be demanding more of him immediately after exiting the theater.